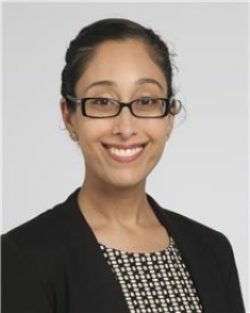 Tamanna Singh, MD, FACC is a clinical cardiologist and a member of the Sports Cardiology Center in the Robert and Suzanne Tomsich Department of Cardiovascular Medicine, Sydell and Arnold Miller Family Heart & Vascular Institute. She sees patients at Cleveland Clinic main campus. Dr. Singh earned her medical degree from Boston University School of Medicine and completed her Internal Medicine Residency at Boston Medical Center. She then completed a three-year fellowship in Adult Cardiovascular Medicine at Icahn School of Medicine at Mount Sinai, New York, NY, after which she returned to Boston to complete her specialty training in Sports Cardiology with the Cardiovascular Performance Program Fellowship at Massachusetts General Hospital. She joined the Cleveland Clinic medical staff upon completion of training in June 2018. Her specific interests include: sports cardiology/cardiovascular care of competitive and recreational athletes, women’s cardiovascular health, cardiovascular care for female athletes, cardiovascular disease prevention and wellness, and diet and nutrition. As a sports cardiologist, Dr. Singh has provided cardiac care for professional sports teams, competitive and recreational athletes and highly active individuals. She has significant experience in cardiopulmonary exercise testing specifically in athletes and has participated in multiple pre-participation screening events for collegiate and professional athletes to help ensure their safe participation in sports. Dr. Singh’s current research interest lies in evaluating effects of a plant-based diet on heart health. She has published research papers in medical journals on exercise, sports and the heart, has presented at national medical meetings, and has presented on women's cardiovascular health at multiple community events. In her leisure time, Dr. Singh enjoys running, yoga, plant-based cooking, reading, and spending time with her family and two dogs. To make an appointment with Dr. Singh, please call 216-444-6697 or visit the Cleveland Clinic Online Appointment Request form.